Spring is celebrated by fabulous pink clouds of cherry blossom, evident all over Japan. When the delicate blossoms burst to life among the sakura trees, the Japanese make for their nearest park with friends and family to picnic under the trees. Why not have your own picnic and enjoy this stunningly beautiful time of year? You can buy cherry-blossom-scented dumplings and other fragrant delicacies from street stalls and perhaps a delicious bento box or miso soup. The locals will love you for joining in on one of the most celebrated events in the Japanese calendar. Take lots of photos! The hanami (flower viewing) season lasts between March and May each year and is an eagerly anticipated event, which thousands flock to from all across Japan. They’ve been celebrating cherry blossom season for centuries in Japan and the phenomenon lasts between one or two weeks. Be the first to see the delicate flowers in the southern islands; starting as early as January in the Okinawa islands and moving up through central Japan; including Tokyo and Kyoto in March and April. Or plan your trip in May when the cherry blossom viewing season reaches Hokkaido in the wilder reaches of the north. Make the most of this brief and beautiful event, in parks, gardens, along rivers and within castle grounds. 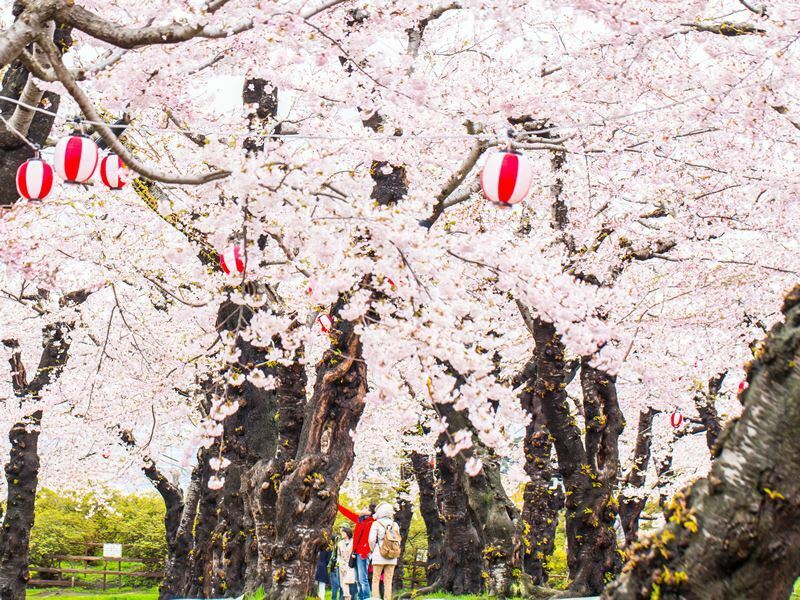 Join in the parties and festivals and celebrate new beginnings with swoon worthy picnics washed down with cherry blossom Pepsi and some serious cherry blossom appreciation that everyone will enjoy, all across Japan’s cities, wide open spaces and rural mountain villages. For a kaleidoscope of fiery foliage, we also highly recommend visiting Japan in the autumn months, when the trees put on another eye-watering show. See below for some suggestions for popular destinations to view the cherry blossoms and the best time of year to visit. Get ready to frame ‘the’ most perfect picture and capture a photo worth sharing, of two iconic sights in Japan. For a short window each year Mount Fuji is surrounded by cherry blossom trees. Two of our favourite places to witness this stunning spectacle are the Fuji Five Lakes region and Hakone. If you’re planning a trip anywhere near Mount Fuji, be sure to time your travels so you can also see the sakura. Ueno Park is a large, public central park in central Tokyo, which means it’s a really busy and popular place during cherry blossom season. If you’d like to celebrate the spring blossoms somewhere lively, with lots of noise and fun, then this is the place to go. 1,000 trees line the street leading towards the National Museum and around Shinobazu Pond and are lit up in the evenings, creating a mesmerising spectacle. 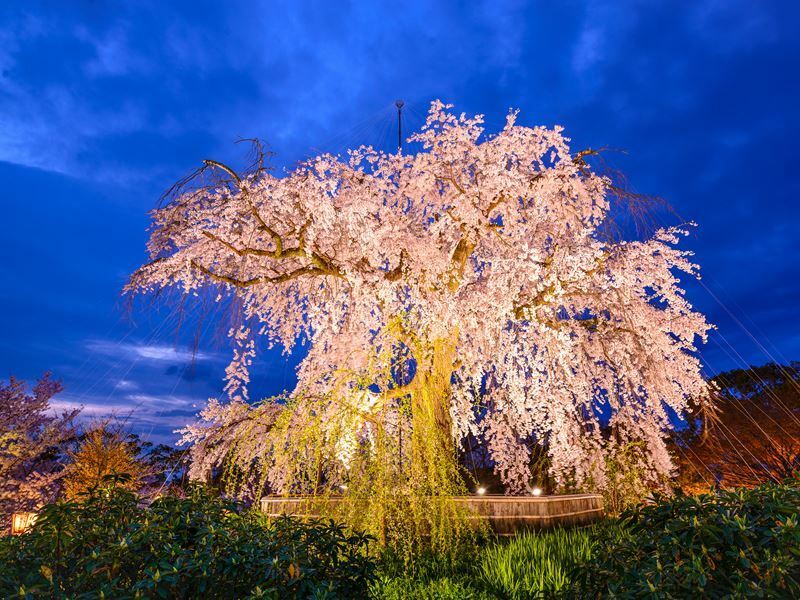 The rows of cherry trees, Somei-yoshino and mountain cherry trees (yama-zakura), are at their blooming best in spring and the park is bursting with people partying and enjoying picnics under the flower canopies. A fun and safe place for the whole family to enjoy the cherry blossoms. 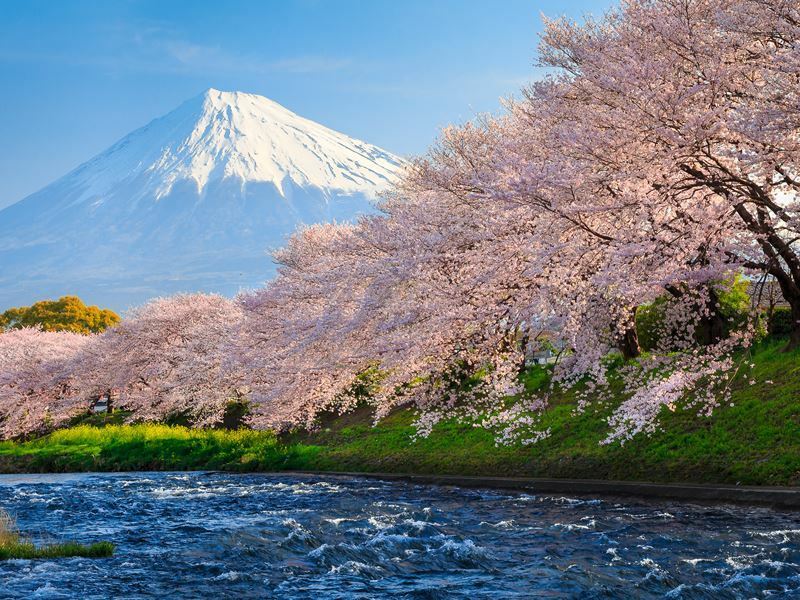 Famed by many as being the best place to see Japan’s cherry blossoms, Mt. Yoshino is almost at the centre of Nara Prefecture. This picturesque spot came to be long ago, after a custom of giving cherry tree seedlings to the Zao-do Hall of Kinpusen-ji Temple. The resulting trees were replanted in the neighbouring mountains and this beautiful collection of cherry trees was born. 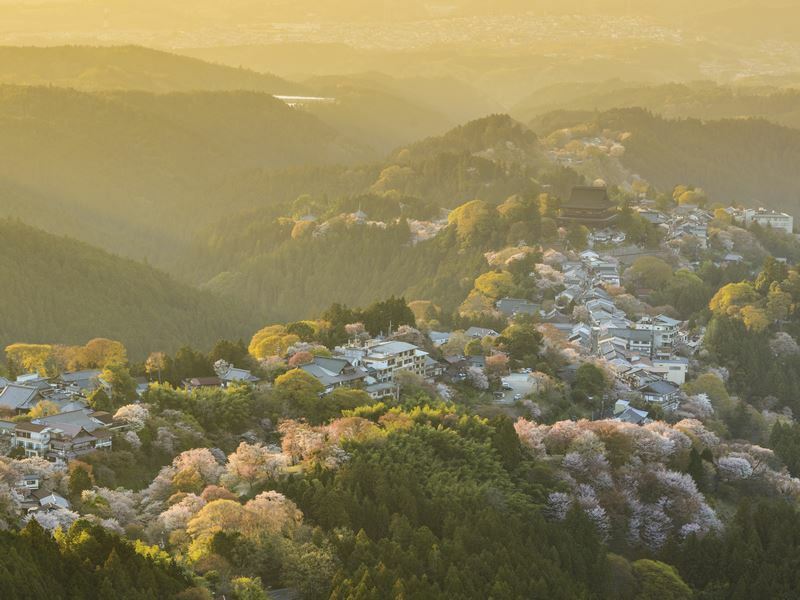 Arrive in early April and you will be treated to the welcoming sight of 30,000 cherry trees in full bloom, from the foot of the mountain up to Oku-senbon (the peak). This gorgeous display of delicate pink flowers lasts for as long as a month and is a sight not to be missed. 800 cherry trees really are the cherry on the cake at this beautiful hilltop castle in Kumamoto, southern Japan. 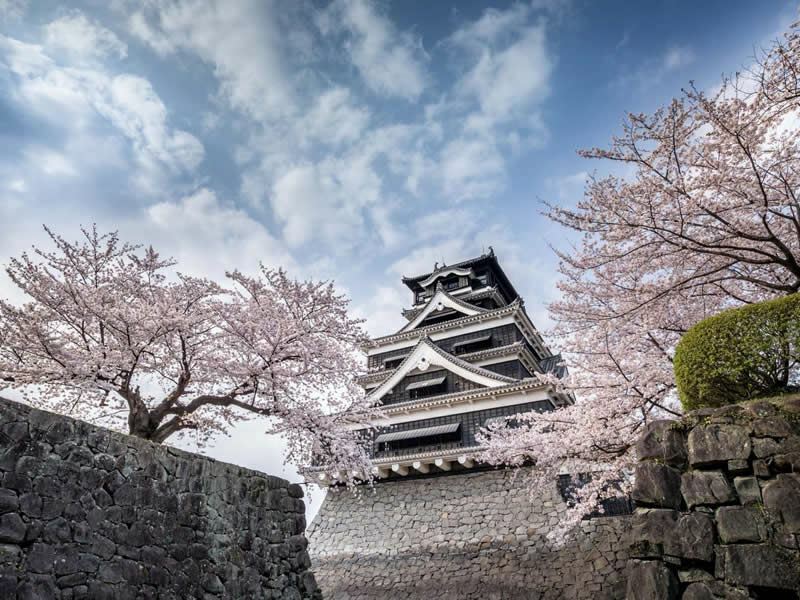 One of the three most famous castles in Japan, it was constructed in the early 17th century and has several really interesting features; a stone wall called Musha-gaeshi, the castle tower, which in black and white creates an elegant contrast with the pink blossoms. There’s also Naga-bei (the long wall) and a large reconstructed keep as its centrepiece. The square at the front of the castle tower and in front of the long wall are perfect viewing spots to enjoy the flower blossoms and take photos. Light up romantic evenings in central Japan with a visit to the hot spring town of Kinosaki Onsen. Located in a green mountain valley with beautiful beaches to the north and easily reached by train from Kyoto in 2.5 hrs. 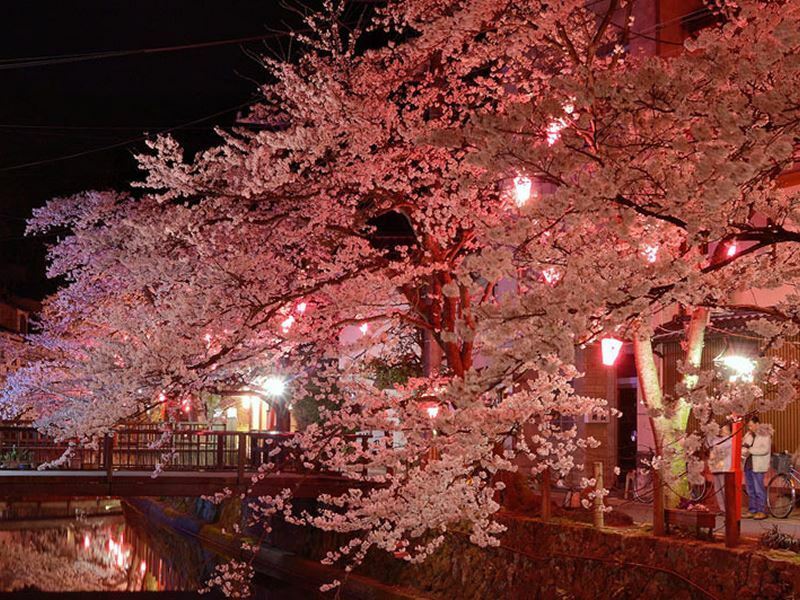 Kinosaki Onsen is a wonderful place to see the cherry blossoms. A unique town with traditional wooden houses which sit along the willow-lined river with its colourful koi carp. Bursting with charms and experiences from old Japan and well worth a visit at any time of year. 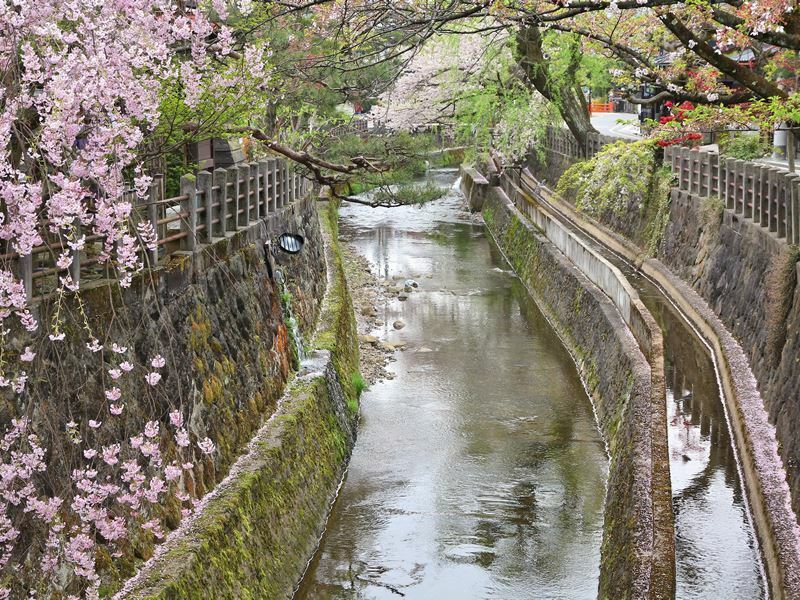 Spring is best though, when the Otani River, which runs through Kinosaki Onsen town, is liberally scattered with cherry blossom, after the sakura trees lining Kiyamachi Road shed their fine petals. At night the trees are lit up, casting an atmospheric pink glow over the street and river. Taste fresh crab in a traditional Japanese inn (ryokan), enjoying the scenery, cherry blossoms and culture. Do all of this wearing your own Yukata, a light cotton kimono rarely seen in modern Japan, but frequently worn here, Visitors are encouraged to wear the yukata, adding to the appeal of Kinosaki and it’s a fun and colourful way to celebrate the cherry blossom season. Take an enjoyable meander through a tunnel of flowering cherry trees, their blossoms tumbling down from laden branches. At their magnificent best in April, this two-kilometre tunnel of trees along the Hinokinai River can be found in the northern part of central Japan. Visit the area for natural beauty and a fascinating history. Kakunodate is enclosed on three sides by mountains and the cherry trees were brought here hundreds of years ago from Kyoto by the local samurai. The classic samurai residences in Kakunodate have a history stretching back over 300 years. This is Kyoto’s oldest park and is justifiably famous for its lustrous cherry trees, with blossoms that sweep down and touch the ground. 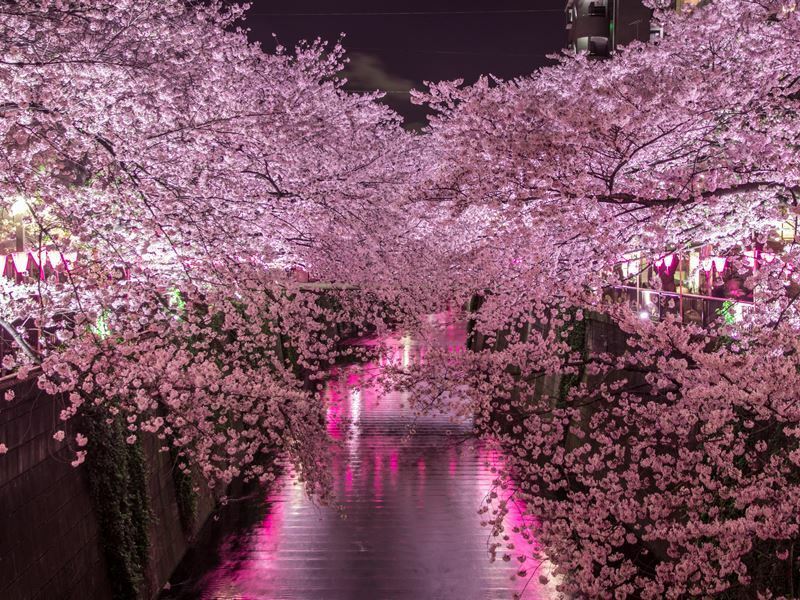 The best time to see the blossoms is at night when the trees are illuminated. 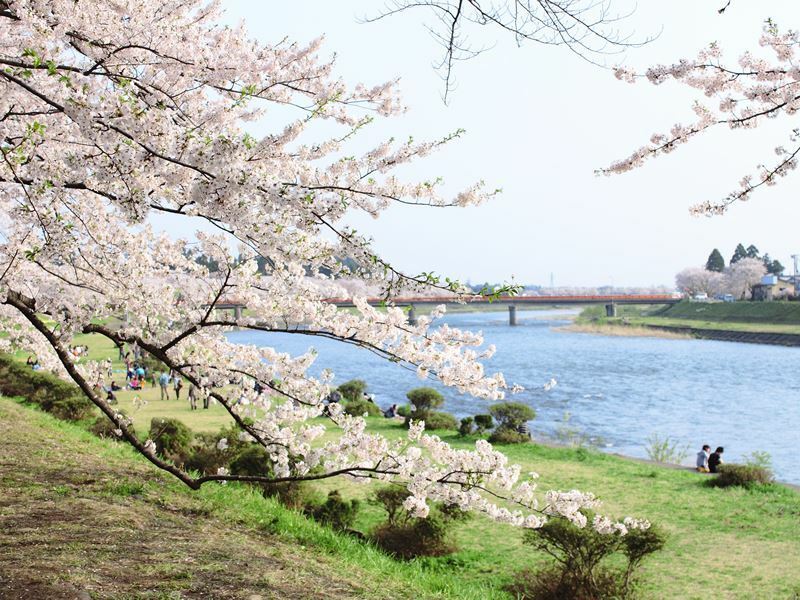 Thousands of people flock here from early April for peak Cherry blossom season, before continuing their appreciation of these beautiful delicate flowers on the mountainside, when the park’s trees start to fade late April. Take a stroll on the Philosopher's Path, from Ginkaku-ji Temple to Wakaoji-jinja Shrine, accompanied by cherry blossoms on both sides of the river path from Lake Biwa-ko. Petals float on the water giving an even more magical appeal to this atmospheric walk between the historic buildings. Autumn is another beautiful season to enjoy a walk along the Philosopher’s Path. With eight UNESCO World Heritage Sites, Nara is second only to Kyoto for culture. 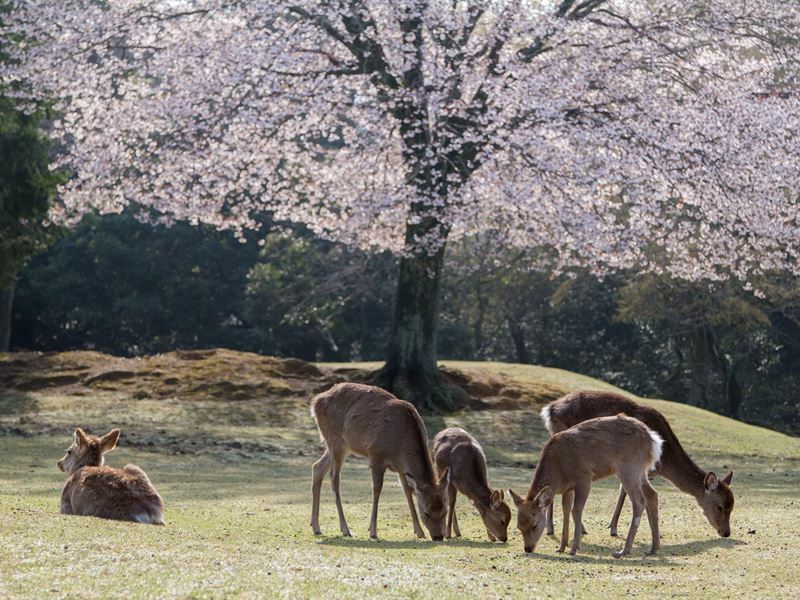 In addition, the delightful city of Nara has an historical park that spreads over a vast area, encompassing a lush green landscape, herds of tame deer and about 1,700 glorious cherry trees of various kinds. Nara Park also boasts a number of scenic spots, like Sagi Pond, the foot of Mt. Wakakusa, the remains of To-do Tower, the Kofuku-ji Temple area, Ara Pond, Kasugano-enchi, and the Todai-ji Temple area. Be sure to allow enough time for strolling here. Take an overnight trip to the compact city of Nara, from Kyoto and see one of Japan’s iconic sights, Daibutsu (Great Buddha) which is a worthy rival to Mount Fuji and Kyoto’s Golden Pavilion. Feast your eyes on the cherry blossoms as well as the Great Buddha; a high temple which can be found in Nara Park. Central Japan’s Takayama City can be reached from Tokyo on the high-speed train. The prettiest time to visit is in the spring, welcoming visitors each year, attracted to the cherry blossom festival. Elaborately decorated floats fill the streets which are lit up at night by Japanese lanterns. Spend tranquil hours boating on the Suimon River in a traditional Japanese ‘washtub’ style boat, beneath cascading petals. At night, enjoy the glow from the sakura trees and indulge your taste buds with festival food, while you enjoy the vibrant atmosphere. 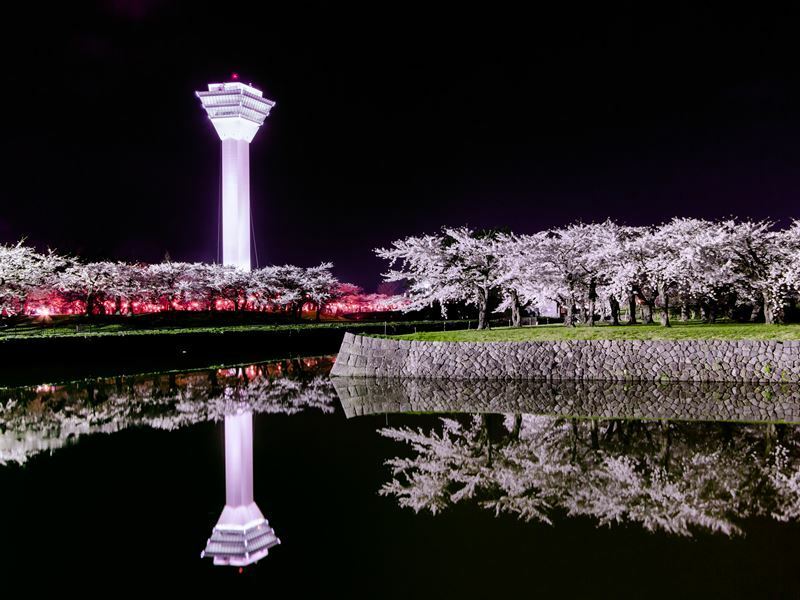 For the final hurrah, head to Hokkaido in Japan’s wild north to see both plum and cherry trees blossom at the same time. Sapporo is the main city here and has an abundance of cherry blossom. Alternatively, head south to Hakodate City and check out star-shaped Goryokaku Park where blossom is abundant. If time and energy are on your side, why not stay on for a bit of skiing with fabulous sakura views included.